October is the official month of terror! This is the wonderful time of year when people scare each other silly and many decide to watch a scary movie every day for 31 days straight. Have you ever attempted this challenge? If you did, what 31 movies did you pick? Do let me know... I am always in need of your recommendations! Meanwhile, in this article, I highlight 31 of my favourite, truly terrifying horror flicks - one for every day of this marvelous and macabre month. A group of friends decide to go on a caving expedition in the Appalachian mountains. Things go terribly wrong when they become trapped. Their only option is to go down, further into the depths of the cave. Little do they realise what horrors await. Based on the novel by Stephen King, Stanley Kubrick's The Shinning is a masterclass in pure terror. Jack Torrance (Jack Nicholson) takes a job as the caretaker of an isolated hotel. He and his family move in for the winter. However, an evil presence exists within the hotel's walls and soon starts to possess Jack - driving him to unspeakable acts of violence. Guillermo del Toro's visually stunning Pan’s Labyrinth tells the story of a young girl called Ofelia who lives in a rural military outpost in post-war (1944) Spain. Her home is full of danger, unimaginable cruelty and repression. Ofelia seeks refuge in her books about fairy stories and by wandering the woods nearby. It is here that she discovers a labyrinth full of otherworldly and fantastical monsters. The residents of Elm Street are being terrorised by a serial killer who murders their children after they fall asleep. Introducing a true horror icon... Mr Freddy Krueger. The transit crew of the spacecraft, Nostromo, respond to a distress beacon on a remote planet. While there, they discover an alien life form - and it isn't friendly. I love the BBFC's description of John Carpenter's Halloween: "in which an escapee from an asylum returns to his old neighbourhood where he stalks and terrorises a baby-sitter." Really, what more do you need to know? Another true horror classic, The Exorcist is shocking, disturbing and very scary. Director William Friedkin believes that you take away what you bring to his film. For me, it is a powerful portrait of a mother's love for her daughter. What does it mean to you? In New England, 1630, devout English farmer, William (Ralph Ineson), is banished from his colonial plantation. He moves his wife, Katherine (Kate Dickie), and five children to a plot of land on the edge of an ominous forest. Things start to go wrong... very wrong. Their baby goes missing and, in among the family’s grief and desperation, paranoia and suspicion grows. Is teenage daughter, Thomasin (Anya Taylor-Joy), involved in witchcraft? Is she to blame for the baby’s disappearance? Or is something more supernaturally evil preying on the family? I always have such fun watching The Cabin In The Woods. You think that it is one type of horror film and then discover that this movie has hidden depths - and, boy, are they dark and twisty. A huge mist engulfs a small US community. However, this is no ordinary mist. Somewhere within lie a host of terrifying monsters. How will the townspeople survive? Based on a story by Stephen King, director Frank Darabont creates a gripping horror with one truly shocking ending. Christine Brown (Alison Lohman) is a loan officer in a small Los Angeles bank. Thinking that she needs to act tough if she is to make progress in her career, Christine refuses an old gypsy lady (Lorna Raver) an extension on her home loan. Sinister is an effective and genuinely unsettling horror movie. Ethan Hawke stars as Ellison, a writer who, unbeknownst to his family, moves into a house where, just nine months ago, a family was murdered. Things take a turn for the (even more) sinister when Ellison finds a box full of super 8 home movies that suggests the murders are the work of a serial killer. Jay's (Maika Monroe) boyfriend passes a horrific curse on to her. She will now be pursued by a malevolent, supernatural presence. Her only escape lies in giving the curse to someone else. Will Jay pass it on? Will she ever be safe again? Ben Wheatley's Kill List is a movie that defies genre. It is a thriller, a hit man movie and a deeply disturbing horror film. I could hardly stand the tension while watching Kill List and felt unsettled for days afterwards. Perfect! It is easy to forget just how scary The Blair Witch Project was when it was first released. However, back in the day (before cinema embraced viral marketing and became obsessed with found footage) this movie was quite a thing. Having re-watched this reason to avoid camping, The Blair Witch Project remains an effective 90 minutes of horror. The Others is a film that creeps up on you and leaves you feeling distinctly unsettled. While awaiting her husband's return from war, Grace (Nicole Kidman) and her two young children live an isolated existence in a secluded mansion. When three mysterious servants arrive, it becomes clear that there is far more to this house than meets the eye. Troll Hunter is a Norwegian found footage film that I absolutely love. I was skeptical at first - this is, after all, a mockumentary about hunting trolls. However, as soon as the film started I became utterly hooked. Florence Cathcart (Rebecca Hall) does not believe in ghosts and sets out to disprove all evidence of their existence. However, a new assignment pushes her to the edge - making her question all that she holds true. The Awakening is a chilling tale with a superb cast. It is hard to believe that Shaun Of The Dead was released 12 years ago. Edgar Wright's zombie horror comedy feels as fresh today as it did back in 2004. Time to return to The Winchester? Another horror comedy - this time from New Zealand. After a failed robbery, Kylie Bucknell (Morgana O'Reilly) is remanded to the custody of her estranged mother, Miriam (Rima Te Wiata). Miriam believes that evil spirits lurk in their home and Kylie begins to wonder if she is right. I just love Housebound. It is smart, tense and really very funny. Danny Boyle's movie starts with stunning shots of deserted London streets. A virus (handily called Rage) has infected the population, turning humans into crazed zombie-like creatures. How long can Cillian Murphy and his group of survivors last? Author, Maddie (Kate Siegel), moves to a remote cabin in the woods (of course) to write her new book. All is going well until, one night, a masked psychopath appears at her window. So far so generic right? Well, don't write this film off yet. It is actually really effective. First, Maddie is deaf - which leads to several scary, he's behind you moments. And, second, she's not going down without a fight. To round off our list of 31 horror films, how about a jolly Christmas tale full of blood, guts and the creepiest Santa you'll ever see? Rare Exports is a brilliant film with humour and festive scares. What Scary Movies Will You Watch This October? Are there films that you would add or discard? 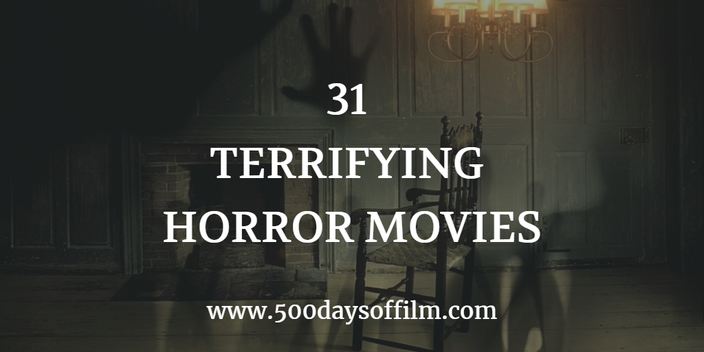 Are you planning to attempt 31 days of horror this October? Whatever the case, let me know. Leave me a comment in the box below! This will be my 7th year of doing 31 Days of Horror, so I won't try to name what I watched. I'll only say I always thoroughly enjoy it. Glad to see you have a mix of serious and not-so-serious horror on your list. Great job!